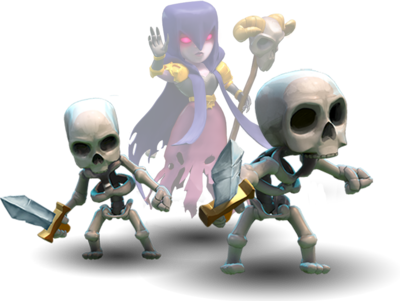 The Skeleton is one of many Dark Troops in the Clash of Clans game. This undead creature poses little threat by itself. But it never fights alone, since the Witch can summon an endless horde of Skeletons against your enemy! Skeletons are troops the Witch summons to help her fight. 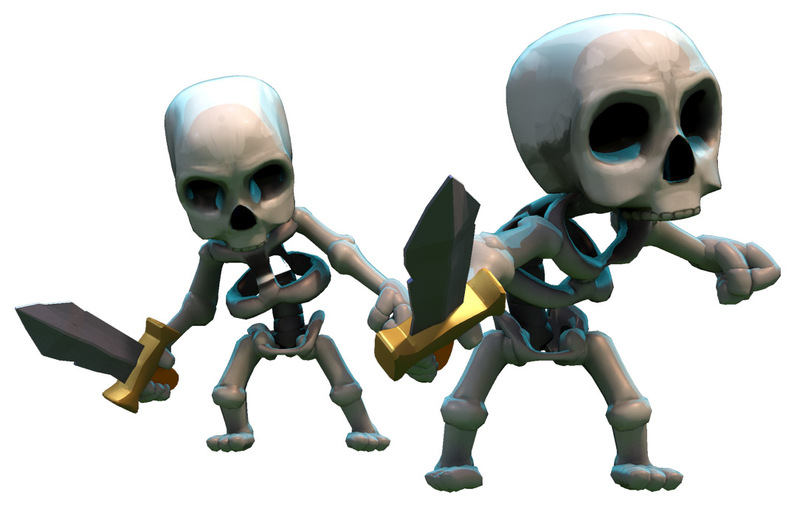 They are similar to Barbarians in attack damage, but have lower health and move faster. The Skeleton gives out the same amount of damage per second as the level 1 Witch. Witch/Skeletons have no preferred target when attacking; they will simply attack the closest building to them. However, once they become aware of enemy Clan Castle troops, Heroes or Skeleton Trap skeletons (either by being attacked themselves or being near another friendly Troop under attack), they will leave their previously targeted building and engage the enemy Troops instead. Once all of the nearby enemy Troops are defeated, they will proceed to attack the nearest building from their current location. Skeletons act like Barbarians to Witches. They go hand in hand with the Jump Spell. Witches in your Clan Castle will summon hordes of Skeletons to confront the enemy. Single-targeting defenses like Cannons can be overwhelmed by Skeletons (especially if the single-target defense cannot one-shot the Skeleton), so splash-damaging defenses like the Mortar and the Wizard Tower are your defense’s best chance of eliminating hordes of these subtroops. Have Mortars and Wizard Towers as high-leveled as possible; they can be able to one-shot Skeletons and this leaves the Witch vulnerable to the defenses. Inferno Towers set to multi-target are also good at eliminating a few Skeletons at a time. Skeleton’s stats do not change when the Witch is upgraded. When you have a Witch in your Clan Castle, and it creates Skeletons during a defense, the Skeletons that were made do not go back into the Clan Castle. As one of the three subtroops (the others being the Golemite and the Lava Pup), it cannot be trained, placed or donated directly via the Clan Castle (although the parent Troops can). The Skeleton is currently the only subtroop that is summoned (rather than spawned upon death) by its parent troop, and the only subtroop that is not a smaller version of its parent troop. The Skeleton appears to be identical to the Skeletons that are spawned via the Skeleton Trap, unless the Skeleton Trap is set to target air troops. Unlike the Skeleton Trap’s skeletons, they do not have a skull next to their health bar. Also, unlike the Skeleton Trap’s skeletons, they do not have a permanent health bar. The skeleton is one of the two troops you can not level up, the other one being the Lava Pup.